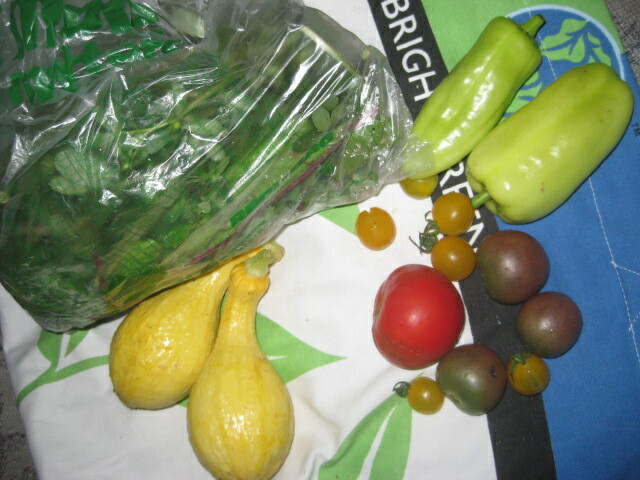 CSA #8: Summertime? Time for Summer Squash! By this past week’s CSA, I had assembled quite a collection of summer squash, specifically the yellow summer squash variety. Why have I been carefully sealing the squash up and storing it in my crisper when I could have been cleaning it, chopping it, and cooking it for breakfast, lunch, and dinner? Well, the short answer is… I don’t really know. The longer answer, the answer that you know I’m going to expound upon because you read this blog and you know how long-winded I can get about trivial matters, is that I’ve become a bit of a hoarder when it comes to foods. Whether it’s a trip to the market or our weekly CSA, there are certain vegetables that I hold onto till the point of inspiration, and sometimes well past the point of inspiration. These are the foods that I can’t simply dump into just any old dish. These are the foods whose mere presence in my fridge makes me that much happier to be in the kitchen in the first place. These are the foods that are stored in the crisper until the brink of rot, just to be rescued at the last minute by whatever dish could use a little extra something. 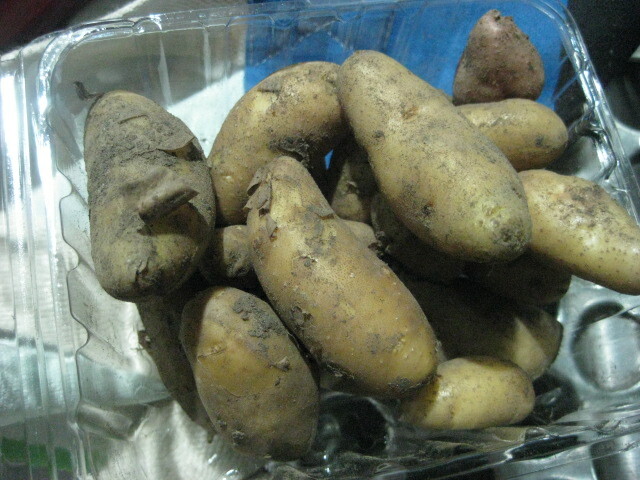 They were meant for so much more, but alas, time is a merciless force upon produce. It’s a pseudo-fixation that is seemingly random as to the choice of its targets. 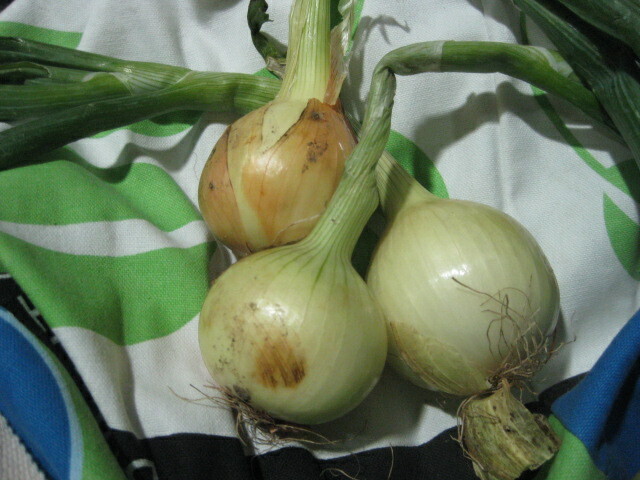 For instance, though I use onions in almost every other dish I make, I have no intention of hoarding onions. It would make much more sense if I were hoarding onions, considering how often I use them, but instead, I hoard things like summer squash, for which I have limited (but delicious) uses. Is my hoarding inspired by my desire to keep close something that is not oft present in my fridge? Or is it mere laziness and lack of knowledge? Perhaps I hold onto veggies that I don’t use on everyday basis because I simply don’t trust my ability to cook them effectively. 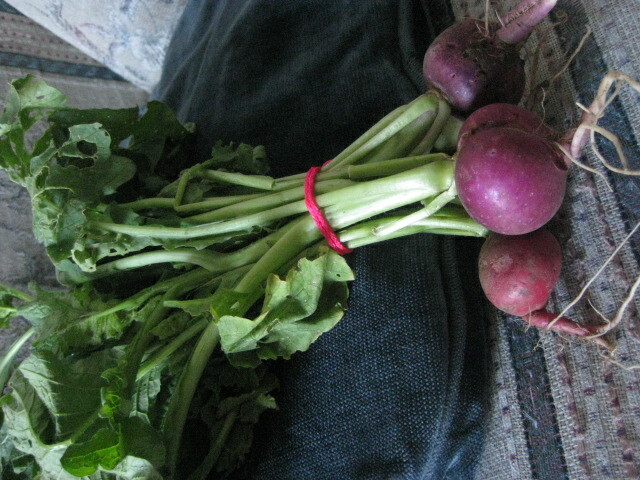 Such was the case with the kohlrabi earlier in the CSA season. The bok choy. 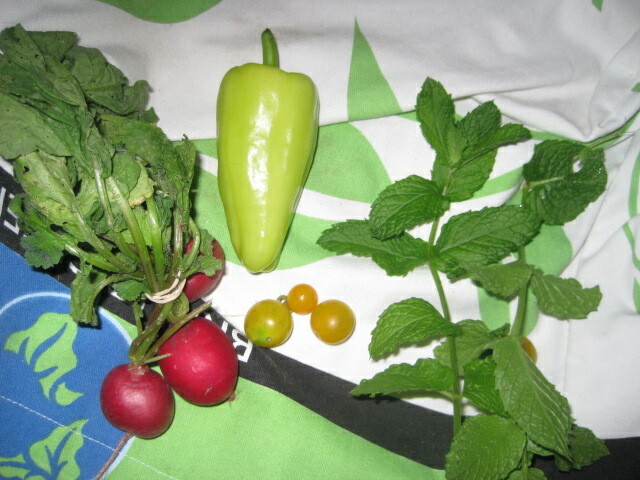 Even the radishes! 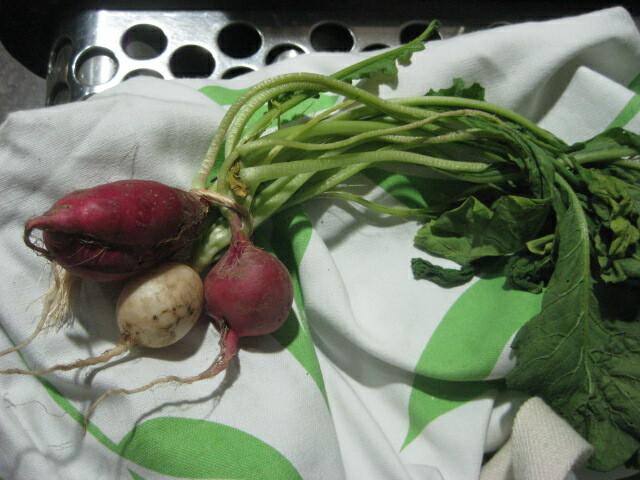 (Although after finding that cold salad recipe, I haven’t had any issues using up my radishes.) Maybe my hoarding isn’t hoarding at all, but an insecure act of protection to keep the vegetables from being used incorrectly. Anything in your crisper you’ve had trouble letting go of? If so, why? Onto the bounty and bonus recipe! Braising mix, sweet peppers, assorted tomatoes, summer squash. 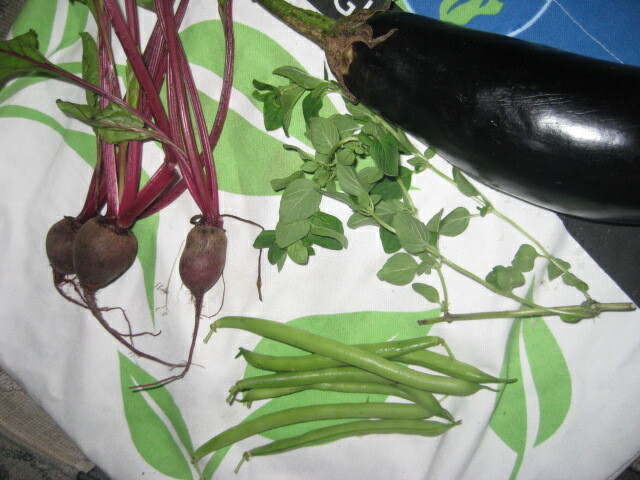 Beets, purslane, eggplant, green beans. 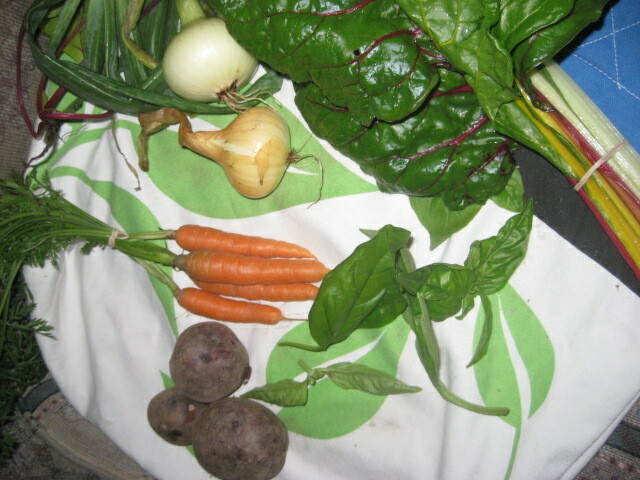 Onions, Swiss chard, basil, carrots, potatoes. – In a medium-sized pot with a lid, saute the onions in olive oil until translucent. Add the squash, roasted red peppers. Allow to simmer at low heat until everything is tender, adding salt and pepper to taste. – Pour the non-dairy milk into a shallow bowl. In a second bowl, combine the flour with the rosemary, basil, smoked paprika, salt and pepper. – Coat your eggplant by first dipping the rounds in the milk, then by tossing them in the flour. Make sure to get a light, even coat around the whole piece, including the sides. – Heat vegetable oil a large frying pan on the stove. Add the slices, frying until each side is golden brown. Set eggplant rounds on a paper-towel covered plate to cool and drain. 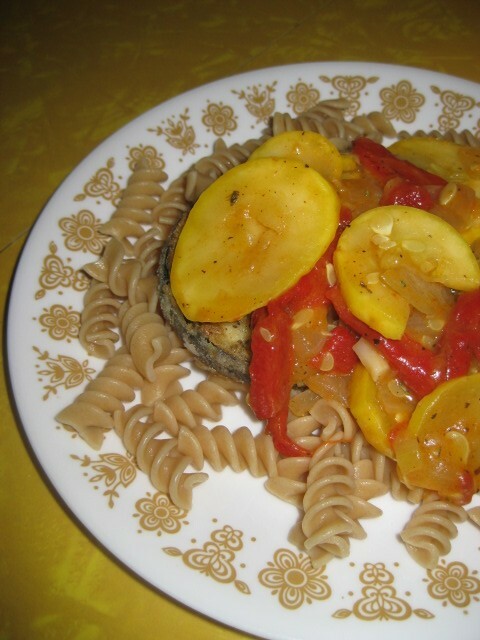 – A top of a generous helping of pasta place two eggplant rounds, then a scoop of the squash saute. For non-vegans, add a sprinkling of Parmesan or a few chunks of Gorgonzola. I’m going to do what surely almost every other unproductive person is doing right now and blame the heat for my lack of productivity. The heat and a rejuvenating weekend trip to DC have led to a complete lack of momentum on matters both business and personal. No blogging, no article writing for the Patch, not even a box filled for my impending move. What’s worse, in the last week, I’ve spent a total of an hour cooking time in my own kitchen. The real tragedy there, aside from missing the cooking time itself, is that every week we’re getting a big supply of fresh from the earth produce through our Garfield Farms CSA. And every week, we come this close to wasting something because we just didn’t move fast enough, we just didn’t make the time, we just didn’t have the time. 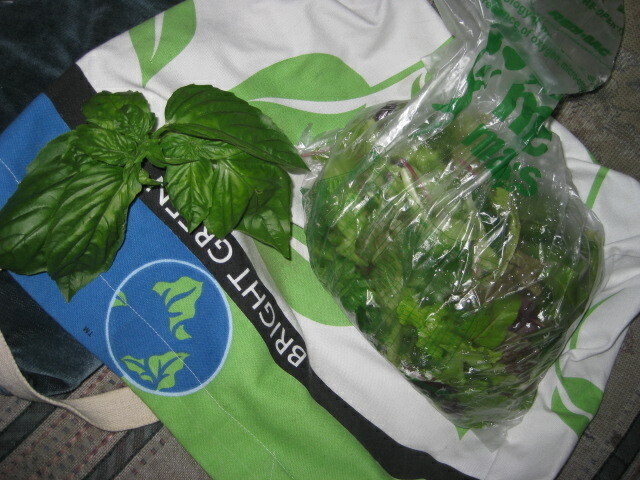 Every time I have to throw away even half a cup of salad mix, I feel a little sick to my stomach. Recently I interview a woman for the Patch who runs Victorian tea services from her house and she shared with me her general philosophy regarding the teas. The services are meant to be enjoyed slowly and savored for more than simply their culinary delights. Tea and snacks and the accompanying conversation are the medium to relationship building. When we savor the process as much as the relationship itself, we are truly engaging with one another. I bring this up not as a great argument for the installation of tea time in the American workplace (although I am a firm supporter of that issue) but as an analogy to what my relationship with the CSA should be. I should be savoring the process of working with what I’ve got more than simply the stuff itself. It’s all well and good to have a beautiful summer squash fresh from the farm, but if I’m not cooking with it, it is simply a totem, a symbol, an idle trinket. 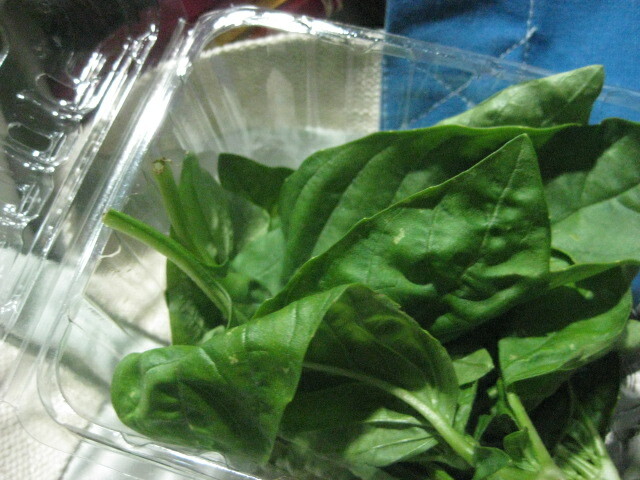 I need to savor these weeks with my veggies. These weeks are fleeting and numbered, and besides, I need to learn to save a buck and stick to what I already have in my kitchen instead of going out to the grocery store in a moment of impulse. CSA #4 & Asian Slaw! 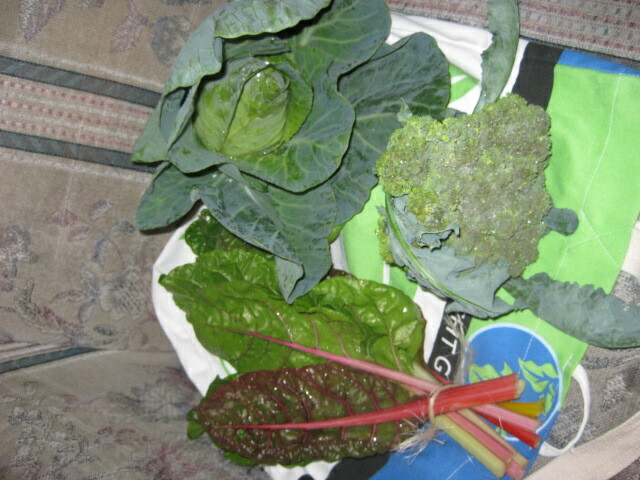 The third week of our CSA was the most adventurous yet, what with cauliflower, green kohlrabi, and a big bunch of bok choy. 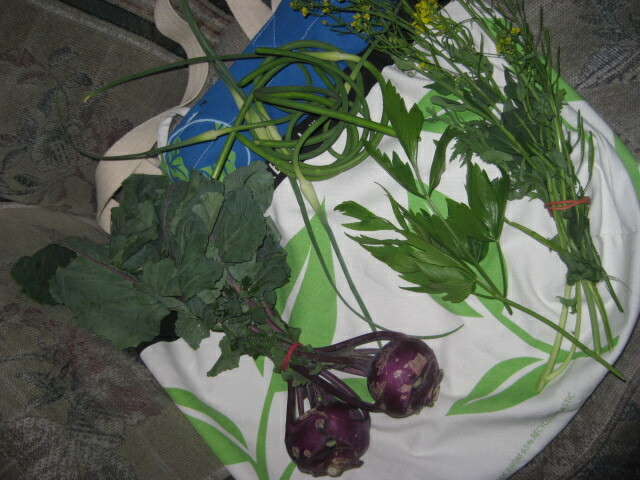 I’ll get to the eventual fate of the kohlrabi and bok choy in a minute, but first: CSA #4! 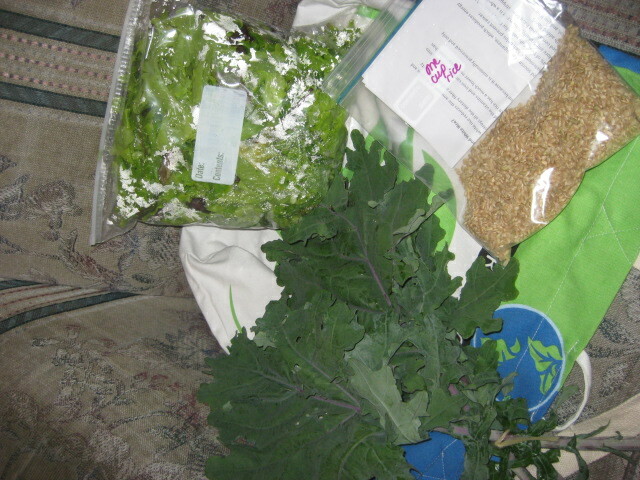 From left: kale, salad greens, brown rice. 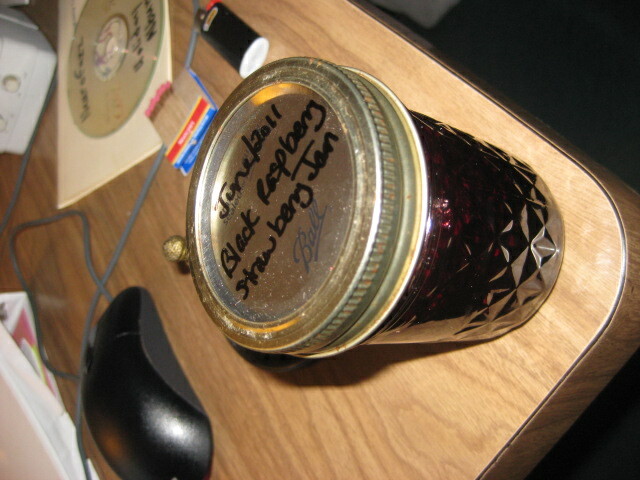 There was a large patch of black raspberries growing, so one of the volunteers offered to make a batch of jarred preserves for the CSAs this week. We ate our way through it most of the weekend, smearing it on whatever neutral surface we could find. I tried to convince James to eat it with a spoon, but he had to draw the line somewhere. Anyway, as to the fate of the green kohlrabi and bok choy, I was a little worried about spoiling if I held onto them past this week, so I made it one of my meal-planning objectives to figure out a good way to use them. A few of you had some really great suggestions. I especially loved the idea of making a nice vegetable stock with the bok choy, but with the summertime heat and the lack of open windows in my kitchen, it was a tad too warm for anything that needed to simmer for a long while on the stove top. 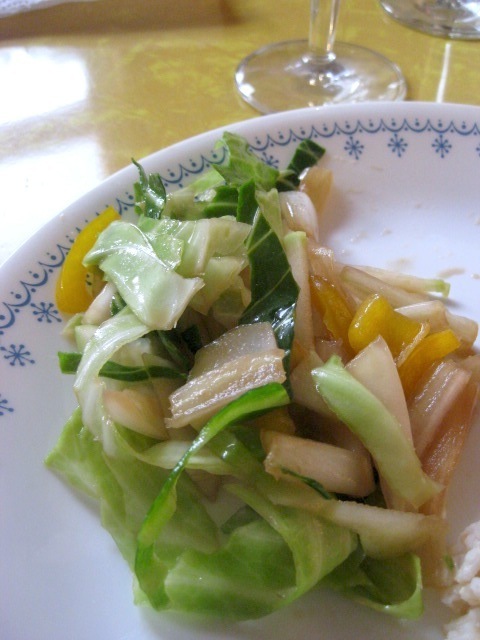 I was still riding on a cold salad high from last weekend, so I decided to take it a step further and experiment with a slaw based off of the bok choy, the kohlrabi, cabbage, and a big yellow bell pepper. Because I don’t have quite the right equipment to make a really shredded slaw, mine came out a bit chunky and extra crunchy. For a finer crunch, really shave down those veggies. A microplane works nicely – and I should get one, along with a knife-sharpening kit. – In a large bowl, combine sugar, soy sauce, vinegar, sesame oil, canola oil. Mix until well combined. – Throw in veggies and toss in dressing. Add the ginger one teaspoon at a time. Mix until all ingredients are evenly coated. Allow to chill for an hour. Garfield Community Farm must have known about my ongoing battles with cauliflower, because we got a nice big head of the stuff this week in our CSA. Well, cauliflower, I hope you’re ready for a culinary fight, cause IT IS ON. We were head over heels wild about the mustard greens last week, so of course everyone else was as well and there were none left to be harvested this time around. 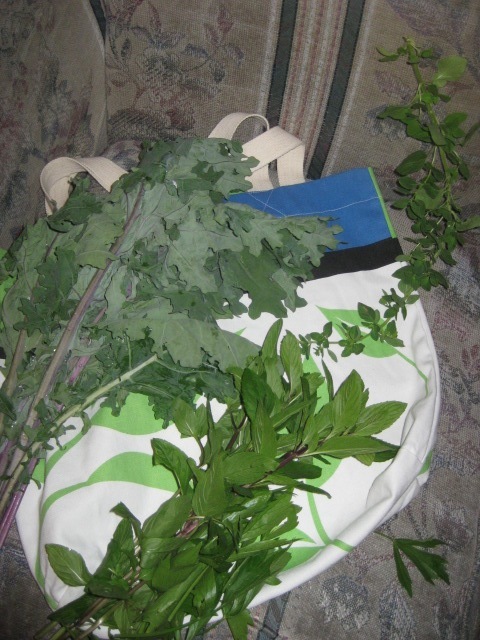 No worries, though, cause we came away with more than enough lovage, oregano, tarragon, and mint (!) to keep our food flavorful for a week. 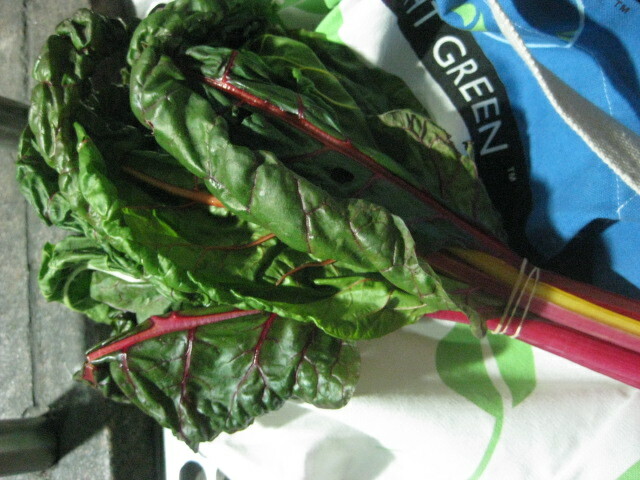 The most unexpected treat from this week’s CSA came in the form of a large head of bok choy. I admit, while I’ve eaten my fair share of it over the years, I have never cooked it myself, so this is going to be interesting. I suppose I could just wimp out and make a stir fry, and honestly, for this first go around, that might be more than enough adventure. Still, can I use an entire head of bok choy in one stir fry? Probably not. If anyone has any good ideas out there, please let me know. 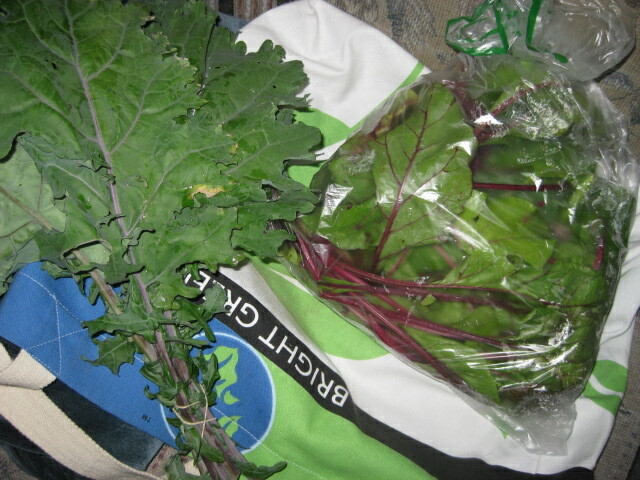 From left clockwise: Russian kale, oregano, mint. 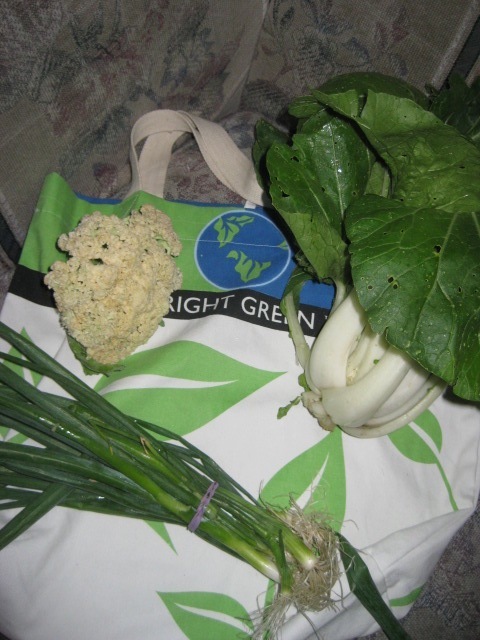 Cauliflower, bok choy, green onions. Green kohlrabi, salad greens, sorrel, tarragon. 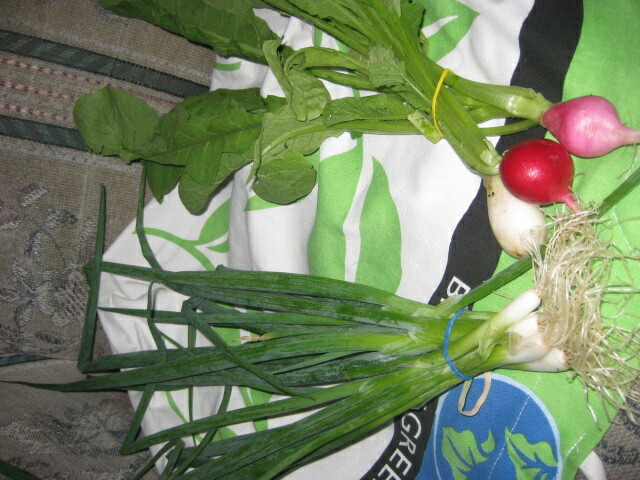 Kohlrabi and bok choy? What about a slaw? I am going to a picnic this week. By the talk on the farm, the tomato plants are growing large and abundant, so I am (fingers crossed) looking forward to some tomato action come next week. I don’t think I’m going to get tired of this. Every Thursday is like Christmas, only instead of reindeer socks that I won’t wear, I’m getting a huge haul of fresh veggies to eat through to next week. 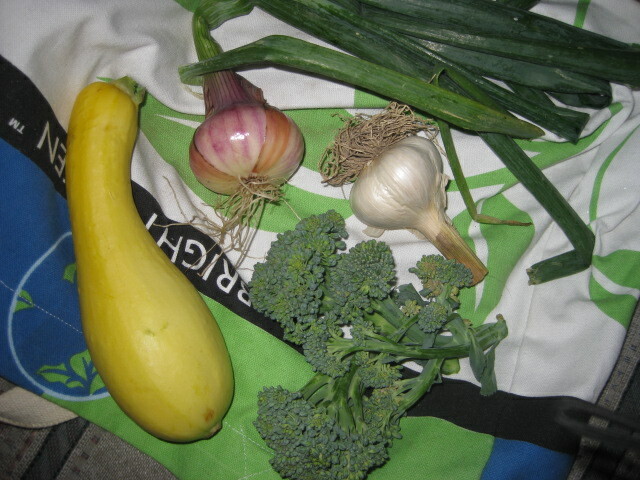 (From left clockwise) Kohlrabi, more garlic scapes (woo hoo, pesto here I come! 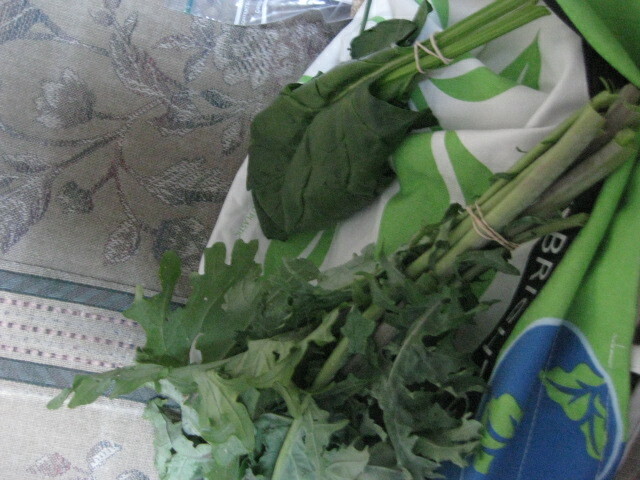 ), mustard greens, and lovage. 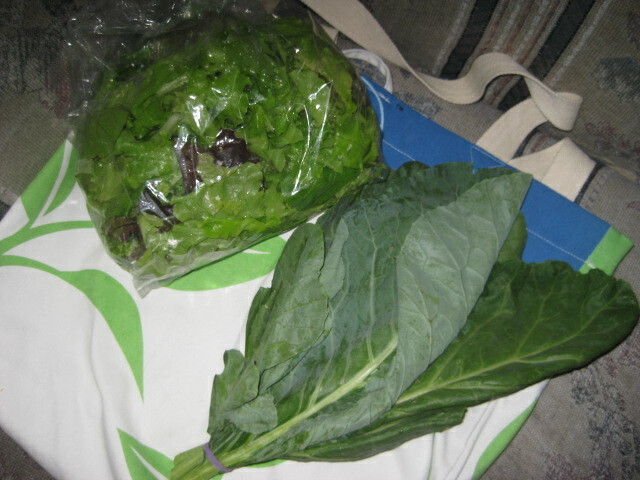 More bagged salad mix and a large bunch of collard greens. Mmm, collard greens. Looks like someone’s making some barbecue this weekend. As I have mentioned before, me and my partner have signed up for a season’s CSA subscription to Garfield Community Farm, a volunteer-run, non-profit farm in the upper reaches of Garfield, just a hop, skip, and long jump away from James’s place in Friendship. One of the reasons the CSA membership to GCF caught my eye is that while other CSA organizations offered more options on subscription length, type of goods, and pick up points, Garfield Community Farm seemed so direct, not just local but super local. Signing up for the subscription meant going to the farm to pick up the produce, walking the very land that was going to grow our consumable goods. 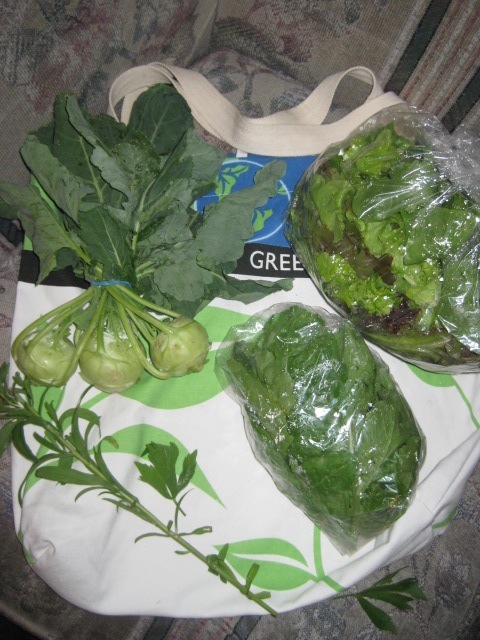 CSA subscribers are also asked to donate some of their time to the farm itself. On pick up days, starting around 6:00 pm, volunteers handle a variety of tasks and chores, all of which benefit the farm and the overall organization. After a few summers of half-heartedly growing a few herbs in my kitchen and on my porch, I’m looking forward to lending a hand… and getting that hand dirty. But enough with the ramble. On to the veggies! 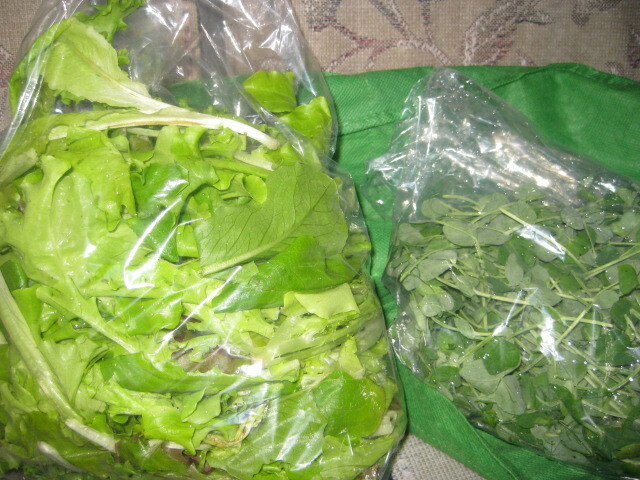 On the left, a pound bag of mixed greens. 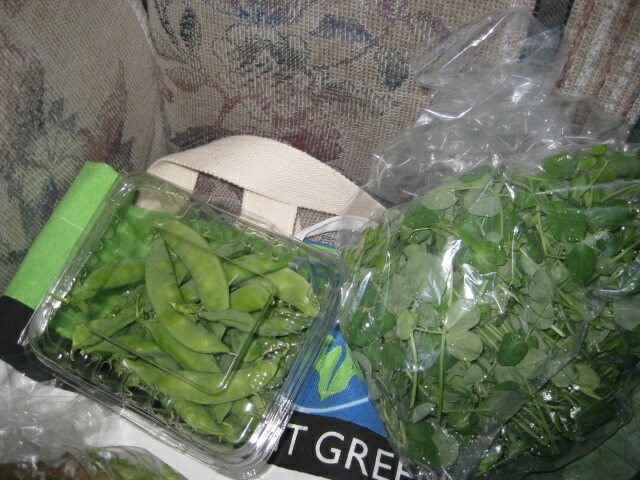 On the right, pea shoots. 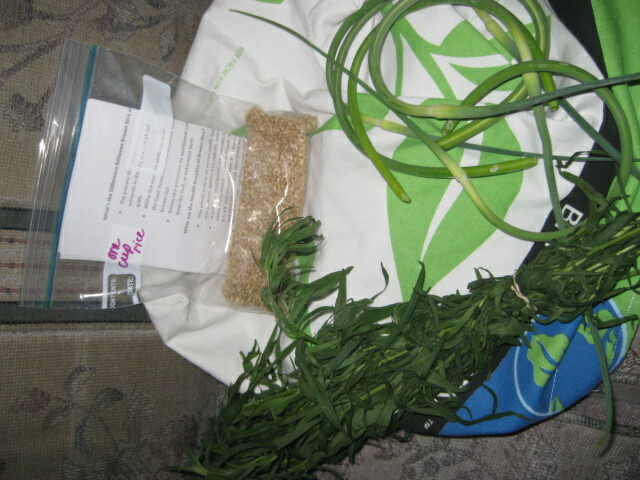 Fresh tarragon (L), a cup of brown rice (center), and field garlic. 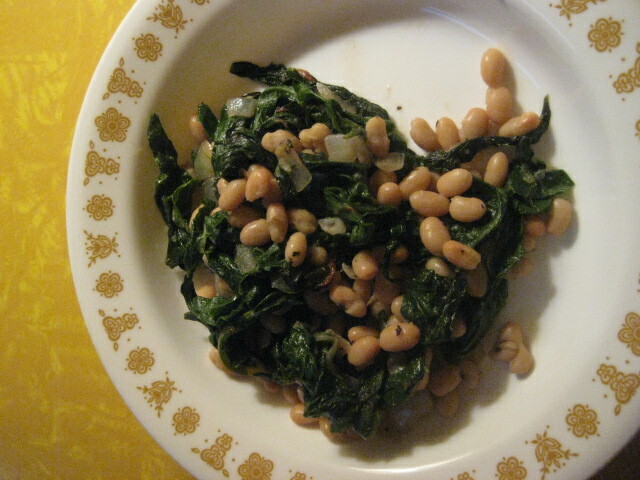 I am envisioning a weekend of beans and greens. If anyone has a good idea of what to do with the field garlic, let me know.